Greens' immigration policies: designed to get money from the growth-lobby? Fear of 'boat-people' coming in massive numbers will continue to be stoked by the Murdoch and Fairfax media and tv and radio. Some people will therefore continue to fear the Greens as agents of the 'boat-people' bogeyman. Others will fear them as politicians who would see their countrymen dispossessed by a strange and unaccountable rhetoric. Vivienne Ortega's article, "No human being is illegal?" draws our attention to one of the great political mysteries of our time. The views expressed in the Greens' policy for "Immigration and Refugees," are quite extreme. If successful they would actually give substance to the grotesque threat that the media have cultivated of endless hoards of 'illegals' overrunning the country. Real 'Greens' scratch their heads and seek ideological or mystical explanations for the persistant coexistence of such policies with ordinary member expectations, but maybe they should look for more practical reasons for this enduring internal dissonance. Some writers on candobetter.net think that the Greens and the Socialist Alliance are pretend parties, designed to confuse the electorate. Even a pretend party, however, needs an income. Why do unpopular policies survive? There is an old political method for working out why unpopular policies survive despite costly impacts. Look for focused benefits and diffuse costs. The people who benefit financially from population growth in Australia are well organised to keep it going, whereas the rest of us, who pay for it, lack the support of the press or the banks which are in favour of this jugganaut for inhuman reasons of profit. Using this logic and method, we can reasonably infer that if unpopular policies survive within the consensus community of the Greens, it is because they benefit some people in the Greens enough to make their time there very worthwhile. If you look at them in that light, the Greens' unrealistic and extreme immigration and refugee policies bear the hallmarks of a strategy to attract finances from the growth lobby to the party. Where else can you read views on immigration as extreme as this? You can read them in the writings of flag-bearers for property development. How do corporate take-overs happen? In fact it sounds like the growth lobby may have already taken the Greens party leadership over. It would not be difficult. It would start with bullies from socialist alliances, earth-sharers and dodgy refugee action coalitions moving in on the finances. Indeed, we hear of this. Later signs could be where architects, planners, and solicitors start to hold leadership positions. In the face of this kind of anti-democratic extremism, bullying, naive posturing and studied nuttiness, reasonable people who want to preserve the environment and democracy will leave the Greens, which seems to be what the Greens want. This doesn't mean that the Greens started out like this; it's how they have become. This exodus of bona-fide members has happened to the decimated ALP already, and probably to the Liberals as well. Toothless political parties make it easy for the corporates to run our political system. 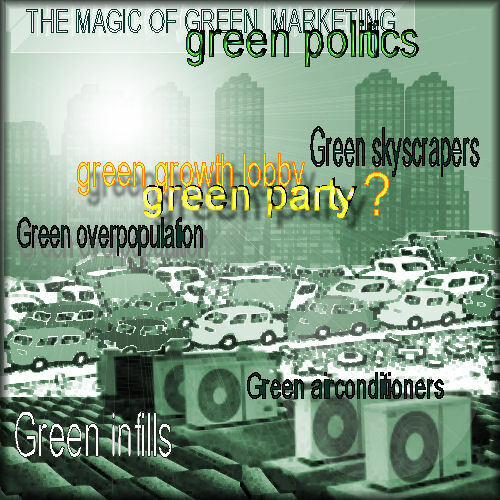 There have been many attempts by many members of the Greens to get a rational population policy over the past two decades. Pseudo-left forces in the Greens have however suppressed these democratic attempts quite savagely and continue to do so. I repeat that these views bear the hallmarks of a bid for corporate funding from the growth lobby. Yes, folks, I don't think this is about refugees or asylum seekers. I think it is about money and advantage from the growth lobby. Why? Because the growth lobby will be the beneficiary and democracy will be the victim. Policies which focus exclusively on benefits to non-citizens don't make sense in a democracy. They don't benefit citizens. must be aware of and which, I would argue, some of them actually courted. The newsmedia will orchestrate a public perception that the "Green threat" of being "overrun by asylum seekers" can only be combatted by increasing "skilled migration"! Cast your mind back to the time of the Children Overboard. (Mr Howard's time.) So-called Greens raised the alarm that asylum seekers were being discriminated against. This cry was taken up by the newsmedia, which conducted a campaign of community polarisation, so creating two largely fictitious extremes. The community was presented with the idea of an uncontrolled hoard of people from god-knows-where streaming in through our coastline demanding economic support versus a moderate stream of highly educated willing workers selected by skilled bureaucrats for the exclusive benefit of our economy. pushing up the costs of land, power, water and education. The government was inviting them through advertisements in every state. These quite viciously false pictures drove wedges between Australians, making the issue of immigration and the consequence of population growth so inflammatory that people were afraid to speak of it. And the "Greens" cooperated with Murdoch et al by hammering in the wedges. Now, did asylum seekers and refugees benefit from this growth-lobby orchestrated electoral division and conquest? The concept of a Green government is a beautiful one that I personally long for. But that doesn't mean that a Party that calls itself Green has any intention of living up to that concept. Look at the evidence. Does it look, feel, sound, smell and taste like environmentalism or democracy? They say that patriotism is the refuge of a scoundrel. Well, these days Green seems to cloak some very mealy-mouthed growth lobbyists who are probably laughing all the way to the bank. loudly point out those professional politicians and NGOs whose actions actually undermine our democratic voices, our shelter and our natural ammenity, for all their soothing, slimy slogans. This article rightly shows that because of their effective support for high immigration, the Greens can't be considered a serious political party in favor of the environment. However, I think the most critical factor about how the existence of the Greens adversely affects democracy and serves Australia's ruling elites has been overlooked. In the 19 years since the Greens were formed in 1992, they have succeeded in drawing out of many thousands of well-meaning environmentalists money and energy that could have been put to far better use. Given that the two major political parties, Labor on the one hand and the Liberal/National coalition on the other, have poor to abysmal records in government and that this has been shown conclusively again and again, it is inconceivable that after 19 years, the decent alternative that the Greens claim to be could not have at least steadily and consistently increased its electoral support. By now such a party should be in government either in their own right or in coalition, in many parts of Australia. At the very least, such a party should have a substantial presence in all Parliaments. With a few rare exceptions, like the 2010 Federal elections and the 2010 Tasmanian state elections the electoral performance of the Greens has been, at best, mediocre and usually poor. If the 'anti-war' Greens could not have performed well in 2004, then when could they ever have? The outcome of the 2004 elections were particularly harmful to Australia, not to mention the rest of the world, and could have been avoided. In 2003 the Howard Government participated in the illegal invasion of Iraq, using a pretext shown to have been a deliberate lie. At the 2004 elections, Howard did not even have to pay the slightest electoral price for his actions and was re-elected with effectively an outright majority in the Senate. The campaign by the Greens, supposedly leaders of the anti-war movement, in those elections did not stop the Liberal/National majority from gainining an outright Senate majority, where the proportional quota voting system should have made that easily achievable. At the recently concluded 2010 Victorian state elections, the Greens won no lower house seats and were again unable even to stop the Liberal/National party from winning an outright majority in the upper house. The outright majority that the Liberal/Nationals have gained has taken away from Victorians any recourse in Parliament against the Liberal/National Coalition Government until the next state elections in 2014, should it choose to govern in a way which is as harmful to ordinary Victorians as they have in the past. I don't believe that the Greens would perform as poorly as they nearly always do unless it actually suited the purposes of those in control of the Greens not to wield any effective influence in Parliament. If they were to hold the balance of power or even were to form Government, then their supporters would rightly expect them to do something for their benefit. This would mean that the Greens would either have to act against the powerful vested interests they claim to be against or be shown up as the frauds that I believe most of them to be. 1. As shown in the recent movie Fair Game or in the YouTube broadcast of testimony by CIA agent Valerie Plame Wilson before the US Senate (also embedded in this comment), upon which Fair Game was based, the pretext given by The U.S. government and the Australian government for the invasion of Iraq was a lie. That lie was that Iraq had a secret nuclear weapons program, which it intended to use on other countries. In Australia, the largest demonstrations since the Vietnam, War were held against the threatened invasion. In defiance of public opinion, Howard proceeded with Australia's participation in the invasion of Iraq. As the Greens were part of the leadership of the anti-war movement, they should at least have gained massively, but didn't. If they could not gain in those circumstances, then how could they ever expect to? See also Valerie Plame Wilson interviewed by Jon Stewart on The Daily Show on 30 October 2007, Wikipedia and Sixty Minutes.